Additional 11:27 London Paddington to Penzance due 17:33 will be diverted between Reading and Taunton. This is due to a problem currently under investigation. OK if this is an additional service and was planned to operate via Westbury but why put up the reason given over 7 hours before the service is due to commence operating rather than to admit to yet another f***-up. 17:36 Swindon to Westbury due 18:17 will be cancelled. Customers at Swindon and Chippenham travelling to Trowbridge or Westbury should travel on the 18:00 Bristol Temple Meads service from Swindon (18:14 from Chippenham) and change at Bath Spa for the 18:36 service towards Portsmouth Harbour which calls at Trowbridge (18:54) and Westbury (19:01). 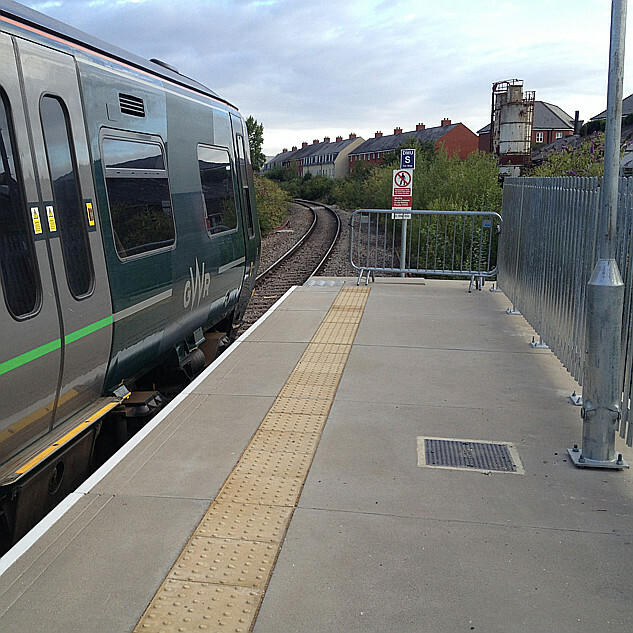 Customers travelling to Melksham should change at Chippenham and speak to station staff. Customers at Melksham will be provided road transport from the station car park. At least clear instructions were given on what to do or what’s been provided. Having cut the timetabled service from 18 trains to 7 for engineering works, a further cut on the day to 6 - with the extra train being removed being the peak service - is a little frustrating! Due to a fault with the signalling system at Swindon fewer trains are able to run on some lines. Train services running through this station may be delayed by up to 20 minutes or revised. Disruption is expected until 09:30 08/06. Owing to signalling problems in the Swindon area the number of trains passing through the station has had to be reduced either by cancellation of diversion via alternative routes. This will affect services between London Paddington and Bristol Temple Meads, London Paddington and South Wales & Swindon and Westbury via Melksham. Those services still operating through the Swindon area will be subject to delay. Axle counters have failed around Wootton Bassett Junction. Paddington-Cardiff shuttles also cancelled. Alternate Bristol TM-Paddington services diverted via Newbury. 19:32 Westbury to Swindon due 20:22 will be cancelled. This is due to a shortage of train crew. Customers at Westbury and Trowbridge travelling to Chippenham or Swindon should travel on the 19:45 Bristol Temple Meads service (19:51 from Trowbridge) and change at Bath Spa for the 20:49 service to London Paddington which calls at Chippenham (21:00) and Swindon at 21:15. Customers at Westbury and Trowbridge travelling to Melksham should contact station staff or use the Customer Help-Point. Customers at Melksham will be provided road transport to Chippenham from the station car park. 20:35 Swindon to Westbury due 21:20 will be cancelled. Customers should use the next service, the 21:10 from Swindon, which calls at Chippenham (21:27), Melksham (21:36), Trowbridge (21:46), Westbury (21:53). 18:32 Westbury to Swindon due 19:21 is being delayed at Westbury and is now expected to be 21 minutes late. This is due to train crew being delayed. Thank you for letting us know ... not a huge problem if the WebTIS is working. 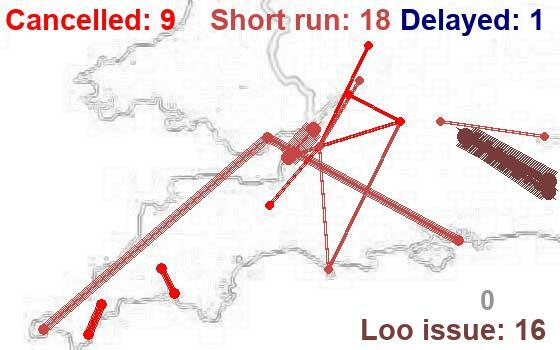 For the record, it was diverted via Bathampton (fail to call at Melksham) as it missed its path on the single line. Facilities on the 17:36 Swindon to Westbury due 18:17. Will be formed of 1 coach instead of 2. Not just the IETs being cut in half then! With more of the 153s going off lease soon the concern is one coach may turn into no coaches.